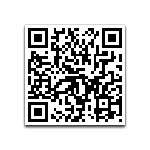 This is called a QR (Quick Response) Code which contains the URL (web address) of SinglesOver60.co.uk. If you have a QR Code reader on your phone (There will be an app for that, such as Google Goggles for Android, or QR Reader for Apple phones) you can take a photo of the QR code using your phone's camera and it will automatically open our website within you your phone's mobile browser, saving you having to type the address in. Then you can bookmark our website and log in to your account and send and receive messages from anywhere.